All kinds of things can cause panic to rise within you and when it does, I am going to ask you to wait. To breathe. To pray. To go to God first instead of trying to immediately fix it. “This is your Father you are dealing with, and he knows better than you what you need. With a God like this loving you, you can pray very simply. 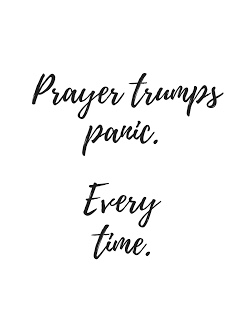 When you go to God with your panic, He knows what to do and what needs to be done. He knows how to calm your heartbeat and clear your mind. Why? Because He is your Father and He knows you. He knows why it is happening and why you responding to it that way. He also knows how to lead you down the right path, not just the first one that presents itself. He knows if there is a higher way, a better way or a healthier way to deal with it. It doesn’t have to a long prayer to be a powerful one. Your Father in heaven loves you and knows what even a one word prayer like “help” means. Thank you, everyone needs this message. I am hoping my need isn’t soon. I have never had a problem with panic or anxiety but due to a recent event, I’ve noticed it creeping in. I’m so thankful that my relationship with the Lord has helped me immediately know how to counter the feelings. I can feel like I’m in control of my physical responses as I cast my cares on Him! !